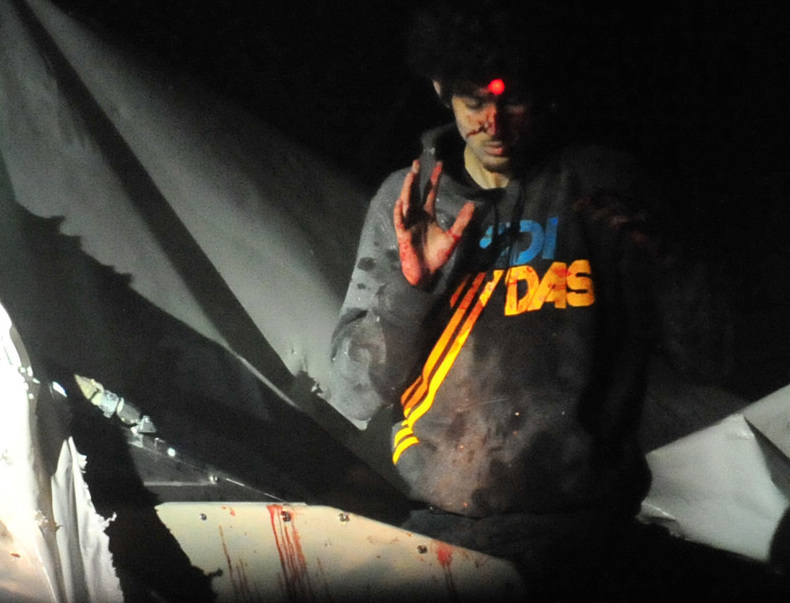 New Photos Show 'Real Face' Of Tsarnaev, Police Sgt. Says : The Two-Way The photo of Dzhokhar Tsarnaev that Rolling Stone put on its cover angered Massachusetts State Police Sgt. Sean Murphy and many others. He's given Boston Magazine photos he took the night Tsarnaev was captured. "This guy is evil," Murphy says. "This is the real Boston bomber." Massachusetts State Police Sgt. Sean Murphy, who released images that depict the capture and arrest of Boston Marathon bombing suspect Dzhokhar Tsarnaev, has reportedly been "relieved of duty," Boston Magazine reported Thursday night. Boston Magazine was the recipient of the police photos. The magazine said that "Murphy has not been fired. The status of his duty is to be reviewed next week." Earlier, Boston.com quoted a spokeswoman with the U.S. Attorney's office as saying that State Police would be "taking action" in response to Murphy's leak of the photos. Angered by Rolling Stone magazine's cover photo of accused Boston bomber Dzhokhar Tsarnaev, which critics say glamorizes the face of a terrorist, Massachusetts State Police Sgt. Sean Murphy has given Boston Magazine a series of images he believes tell a truer story. They include a gripping picture he took of the bloodied bombing suspect standing up in the boat where Tsarnaev was discovered. The red dot of a police sharpshooter's laser sight is centered on his forehead. Tsarnaev and his brother Tamerlan (who died after a gun battle with police) are the lone suspects in the April 15 Boston Marathon bombings that killed 3 people and wounded more than 260. Dzhokhar Tsarnaev has been charged in the bombings and for the murder of MIT police officer Sean Collier three days later. Sgt. Murphy's other photos include scenes of police officers during the manhunt for Dzhokhar Tsarnaev and one of emergency medical personnel treating the suspect for the injuries he sustained. "What Rolling Stone did was wrong. This guy is evil. This is the real Boston bomber. Not someone fluffed and buffed for the cover of Rolling Stone magazine."